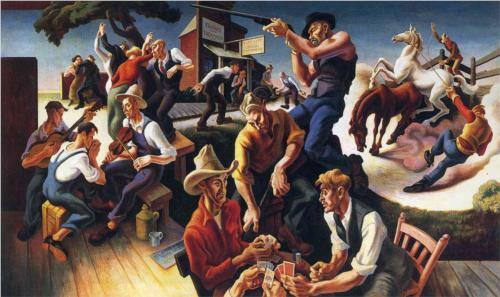 Thomas Hart Benton’s acclaim came from his development of the Regionalist painting style, which rejected the aristocracy of the predominating art culture to show the common man. Studying at both the Art Institute of Chicago and the Académie Julian in Paris, Benton returned to the States in 1913 and continued to pursue painting until serving in the Navy during WWI. After his involvement in the war, Benton gained acclaim in the early 30s. One of Benton’s most famous works, a set of large murals for the Whitney Museum (now at the New Britain Museum of American Art), is entitled The Arts of Life in America and spans five sections. Benton’s regionalism – an art style that raised the status of the American heartland despite the bleak reality of the Great Depression – led to a Time Magazine cover in Dec. 1934. Benton’s transition to teaching brought him in contact with Eric Bransby, one of Colorado Springs most beloved muralists. Benton, Bransby and Boardman Robinson all collaborated together in developing Regionalism in the 30s. Benton’s most famous student though is Jackson Pollock – who eventually moved away from Benton’s style to Abstract Expressionism. 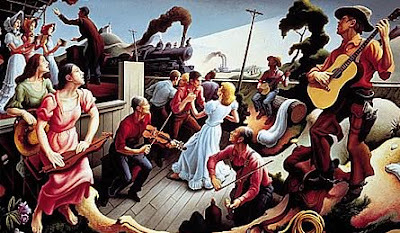 Benton continued to work through WWII, and died aged 85 in 1975 after completing his final mural The Sources of Country Music. 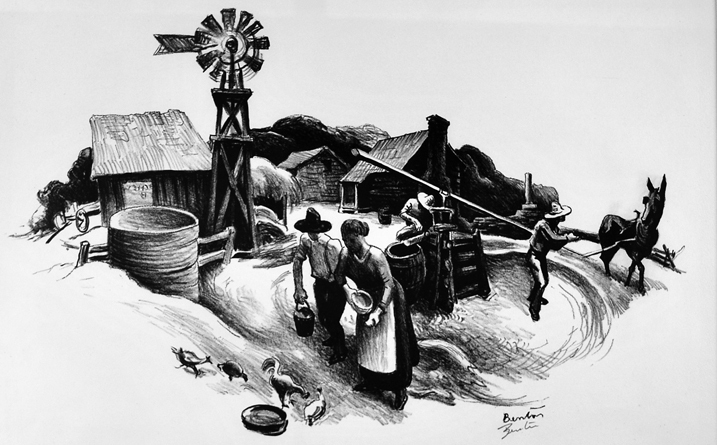 While most famous for his murals, Benton also created many lithographs, now on view through May 27 as part of the Resilience exhibition. The lithographs on view at the FAC were made at the beginning of the Depression era.